In the industry of prestressed structures, hollow core slabs represent the most advanced product. It is a constructive element whose production is highly industrialized and completely automated with the latest world’s technology. The hollow core slabs are lighter than custom prestressed slabs from 37 to 54 %. Thus, the cost of construction is lower, and pillars and beams are having less load. Also, we have smaller dimensions for bearing constructions and for foundations. Hollow core slabs can bridge the spans of 16 m without support, and as a result it lowers the number of supports. These slabs transfer the load in one direction. 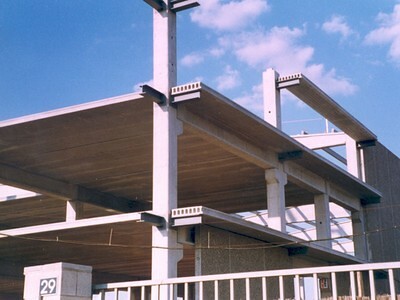 These slabs are not only used in prestressed concrete structures but in masonry and steel structures, regardless of whether it is prefabrication or traditional construction. Application of hollow core slabs saves up to 50 % of concrete and 50 % of armature, all compared to traditional slabs. It means that in structures of 1000 m2 35 tons of concrete and 7,5 tons of armature is saved. Hollow core slabs can hold up to 2000 kg/ m2, typical for production plants and warehouses. Hollow core slabs are immune on fire with two levels of fire resistance REI 90 and REI 120 minutes. 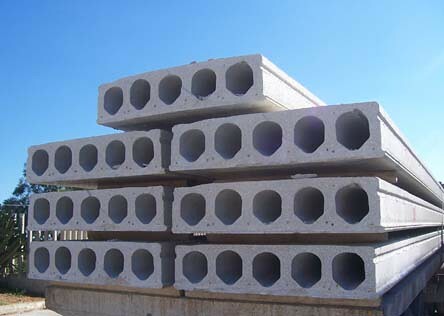 In regard to the sound insulation, hollow core slabs matching even the most rigorous standards, and are convenient for all types of buildings – especially for housing facilities. 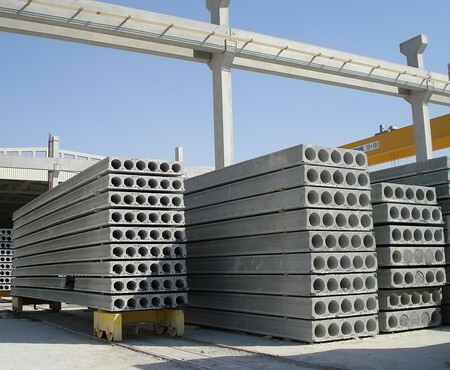 Production and transport of hollow core slabs is fast and easy. In addition, because of decreased weight and appropriate dimensions slabs can be assembled directly from delivery vehicle, whereby reducing the effort and the time of assemblage.